The year is coming to an end in a few days, and weirdly this is the last Sunday of this year & also the first decade. So perhaps, you need to wait for 2011 to get a Holiday in the form of a Sunday. It’s Holidays, but this week has been quite hectic for me. So I decided to take some time off work & blog about things that Social Media underwent in 2010. It’s been an year of new startups, some awkward shutdowns & some new deals signed by Internet giants. The Highlights of Social Media will obviously have Facebook & Twitter fighting for the first place. Though I would say Twitter would be the top highlight as it underwent a major change in design as well as functionalities. Facebook would occupy the second position, because it had small – small changes which were brought about in phases. The Advanced Messaging system was introduced; but we haven’t got to experience it live. 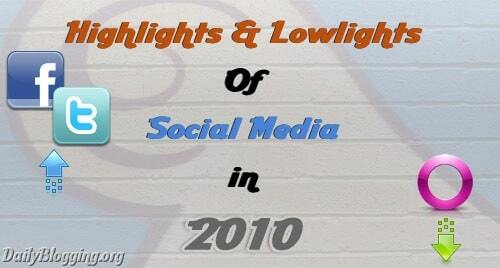 Now, lets take a look at the things that changed Social Media in 2010. I remember when I started off with twitter at the end of 2009, it was kind of a time pass. Just updating some random statuses. RT’ing some quotes which I liked. Overtime, I realized the important of Twitter & how much is contributes as a Social site. I’m sure others who started off in 2009 must have taken Twitter seriously too. Well, every Facebook user who loves facebook will hate Facebook Chat. At least I do, that’s why I put it off all the time. Probably, many of my friends do the same too, because of which Status updates have become a spot of chatting with each other. Now, you’ll find 50+ Comments just on a single Status Update. 75% out of which would be merely replies non-relating to the status which was updated. If your Birthday is nearby, then you’ll be getting a tag on a Calendar generated by some application every alternate day. Before yesterday you would’ve found yourself tagged in Christmas wishes. Tagging is definitely good if done is lesser quantity. I’ve found photos containing 50+ tags but 0 Comments/0 Likes. What’s the use of such a tagging. If you tag less than 25 people on greetings, wishes; you would find that you get a better response now than when you got in tagging 50+ users. Till the mid-phase of 2009, we used to Orkut as a Social Network which could perhaps compete with Facebook at some point if some major changes are brought in it. Instead we’ve seen a steady decline in Orkut’s growth. Frankly speaking, I don’t even visit Orkut once in a month or two. Google tried 2-3 major changes but everything failed to work. In the mid of 2010 we saw Apple coming with the idea of Ping – A Social Network for Music. It isn’t as famous as Twitter / Facebook or any other Social Media, but it certainly created an impact when it was launched. Maybe, because it was launched by Apple. I certainly feel that Ping has a bright future ahead. Steve Jobs, the CEO of Apple also had talks with Facebook CEO Mark Zuckerberg on a collaboration deal between Apple’s Ping & Facebook. Though the talks failed. Read below for more info regarding the talks. Five points are seriously less to describe the changes that took place in the Social Media sector in 2010. Twitter & Facebook both had glitches, downtimes, issues with load time, etc. many a times. 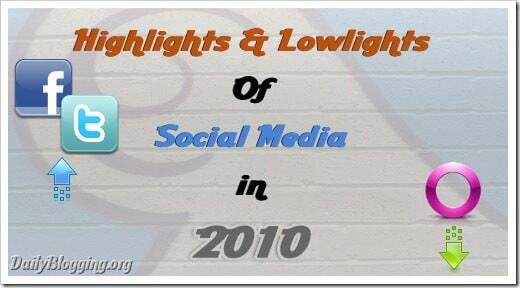 Though overall they were the pick of the Social Networks in 2010. Facebook has certainly overtaken Yahoo! in 2010 in most of the sectors. Twitter is also gearing up nicely to give Facebook a though competition. If you liked this article you can also Subscribe to Our RSS Feeds / Daily Updates. Do you think 2011 will be a more surprising year when it comes to the Social Media Sector ?? other than these 5 points, i think its the people who have given social media a great importance and the people themselves have changed it to a greater extent…. But Orkut forums (communities) are still on top ! We have read through few of your posts and they are amazing. That is the reason we are leaving this comment. blogjunta is organizing THE BEST OF INDIAN BLOGOPSHERE 2010 POLLS. Facebook has grown a lot and is still growing fast. Facebook and twitter are going crazy. The social network has changed the way we live today. Hope there will be many more changes in 2011. Nice post, thanks for sharing. I agree with you and we have seen twitter and facebook going exponentially and people across the globe utilized these social media tools for personal as well as business use.